Hands-on: The first decent affordable hybrid? Since Microsoft released its first Surface device many moons ago, every company under the sun has been racing to create the ultimate laptop-come-tablet. However, to date, the majority of devices that have pulled off the feat have come with fairly hefty price tags attached – the £679 Apple iPad Pro, for example. 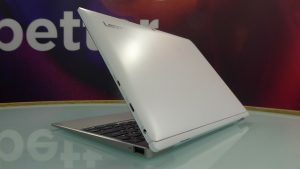 The Miix 320 is Lenovo’s stab at the market, one that aims to offer buyers an affordable hybrid option. Design-wise, the Miix 320 follows the standard hybrid model. It’s a small form 10-inch Windows 10 tablet that attaches to a physical keyboard dock. It isn’t the most attractive I’ve seen, and doesn’t sport the design flourishes of more expensive devices – such as the newly unveiled Galaxy Book. However, by affordable device standards it’s pretty enticing and a definite visual step-up from other affordable hybrids, such as the Asus Transformer Mini. The white model I tested felt well built; I didn’t notice any significant flex when I pressed on its back. Measuring in at just 9mm, the tablet section also isn’t the chunkiest I’ve seen. I’m a big fan of the fact that the tablet attaches to the keyboard using a physical hinge, not magnets. Magnet docking solutions for lighter keyboards may look attractive, but in truth they make using the device on your lap a bit of a faff. Testing the Miix in Lenovo’s demo room I was impressed with the hinge’s build quality and how well balanced the Miix felt. It doesn’t feel particularly top-heavy and neatly sat on my lap without toppling, even when the tablet section was set at its furthest angle. The keyboard isn’t revolutionary, but it felt comfortable enough to type on and had noticeably better travel than thinner keyboard covers – although the keys did feel a little cramped. I didn’t manage to find out whether the trackpad is Microsoft-certified, but early tests were positive. The trackpad wasn’t overly sluggish and enacted multi-touch commands without incident. The design also ticks all the right boxes connectivity-wise. The tablet section features USB Type-C, micro-HDMI and microSD inputs – an LTE version with a nano-slim slot will also be available. The keyboard cover adds two USB 2.0 ports. The wealth of ports means the Miix should meet pretty much everyone’s connectivity needs and significantly exceeds more expensive convertibles, such as the Huawei MateBook and Surface Pro 4. I’m also impressed that Lenovo has managed to fit the Miix with an FHD 10.1-inch, 1,920 x 1,200 resolution touchscreen. The resolution isn’t mind-blowing, but it’s well above average in the affordable end of the market. Most of the cheaper convertibles I’ve reviewed, such as the Asus Transformer Mini, feature lower resolution 10.1-inch, 1,280 x 800 IPS touchscreens. The FHD resolution ensure icons appear sharp and, while blacks weren’t the inkiest I’ve seen, colours look reasonably well calibrated. A digital stylus will also be sold as an optional extra, for those who want to take notes or do creative work on the Miix, but I didn’t get an opportunity to test it during my hands-on. My only concern about the Miix stems from its slightly underpowered internals. At the heart of the Miix is an Intel Atom X5 CPU accompanied by 4GB of DDR3 RAM. Past devices I’ve tested with such specs have at best been netbook replacements, struggling with even moderately demanding tasks, such as digital painting. I can’t say for sure whether this will be the case with the Miix, as in my brief time with the device I only got so far as enacting basic tasks such as opening office documents and navigating between menu screens. However, I didn’t notice any performance stutters during my time with the Miix. This isn’t a hybrid for artists or photographers, but for general users it could be a great all-in-one laptop-come-tablet for web browsing, Netflix-binging and basic office work. The post Lenovo Miix 320 appeared first on Trusted Reviews.